After few weeks Microsoft will introduce the Next Xbox 3, a new generation of console to be released later this year, more details about the hardware leaked today and exactly the architecture of the CPU, which is basically something like an APU from AMD and named "Durango". 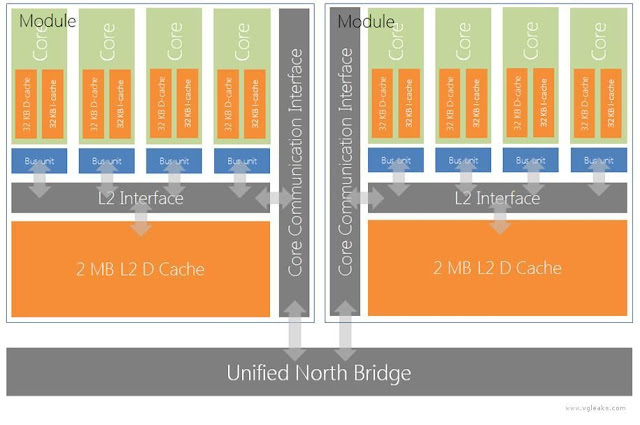 VGLeaks leaked a picture showing the architecture used on the Xbox 3 CPU, the central chip is divided into two modules, each one uses its own 2MB of high performance L2 cache memory interconnected with four cores which mean eight core in total supporting 8 physical threads, these core are running @ 1,6 GHz and uses the 64-bit technology, this architecture is very close to the one inside the Playstation 4. If you want to read a more detailed informations check this page.